Smoking is one of the leading causes of death worldwide. Smokers have higher risk for coronary heart disease, atherosclerosis, acute myocardial infarction, hypertension, clotting disorders, inflammation, respiratory diseases, cancers, etc. A cigarette smoker is exposed to a number of harmful substances. In this study we hypothesized that smoking causes inflammatory reactions and induces hyperthrombic state in the body which may be reflected in erythrocyte sedimentation rate (ESR), total leucocyte count (TLC), differential leucocyte count (DLC) and platelet count values. The purpose of the study was to study the effects of cigarette smoking on erythrocyte sedimentation rate, total leucocyte count and platelet count in adult male smokers and to compare the results with non-smokers and to establish a relationship between the duration and quantity of smoking with the change in ESR, TLC, DLC and platelet count. A cross sectional study was conducted in the department of Pathology on 86 healthy male subjects (smokers=43 and non-smokers=43). ESR was estimated using Westergrens method. TLC, DLC and platelet counts were estimated using HORIBA Pentra ES60 autoanalyser. TLC and basophil counts were significantly higher in smokers than in non-smokers (p<0.05). The mean value of ESR was higher among smokers than non-smokers but it was statistically insignificant. Platelets counts showed no significant difference between smokers and non- smokers. 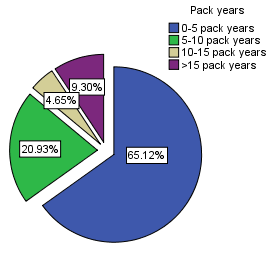 No correlation was observed in various blood parameters and smoking (in pack years). We conclude that smoking initiates an inflammatory response as evidenced from raised TLC, monocyte and basophil counts. World Health Organization. WHO report on the global tobacco epidemic, 2017: monitoring tobacco use and prevention policies. Geneva: World Health Organization, 2017. Nisa M, Zaman S. Study of erythrocyte sedimentation rate (ESR) values and serum lipids in young cigarette smokers. Proc S.Z.P.G.M.I. 2003; 17(2):71-3. Sharma A, Yadav B, Pathak R, Singh AK, Hussein M, Singh S. Effects of smoking on erythrocyte sedimentation rate, bleeding time and clotting time of young adults. Natl J Med Allied Sci. 2014; 3(1):19-23. Islam MM, Amir MR, Rahman MA, Akhter D. Erythrocyte sedimentation rate (ESR) in male adult smokers. Dinajpur Med Coll J. 2013 Jul; 6(2):180-4. Oke OT, Nsa NB, Oyewole OS, Olufemi A, Aderemi AO. Evaluation of haemorheological parameters in cigarette smokers in western Nigeria. Greener J Med Sci. 2012 Dec; 2(6):146-51. Shenwai MR, Aundhakar NV. Effect of cigarette smoking on various hematological parameters in young male smokers. Indian J Basic Applied Med Res. 2012 Dec; 5(2):386-92. Ahmed OA. Effects of smoking cigarette on white blood cell and platelet parameter on a sample of normal subject in Rania city. Imperial Journal of Interdisciplinary Research. 2016; 2(9): 887-92. Nadia MM, Shamseldein HA, Sara AS. Effects of cigarette and shisha smoking on hematological parameters: An analytic case-control study. International Multispecialty Journal of Health. 2015 Dec; 1(10): 44-51. Fadiel FE, Hasan HM. A comparative study on some hematological parameters of some smokers and non-smokers blood samples. World Journal of Pharmaceutical Research. 2016; 5(2):146-54. Mohammed AE, Ahmed MA, Ibrahim IK, Ali EW. Study of platelet count and indices in smokers and ex-smokers. European Academic Research. 2016 Feb; 3(11):12081-88.